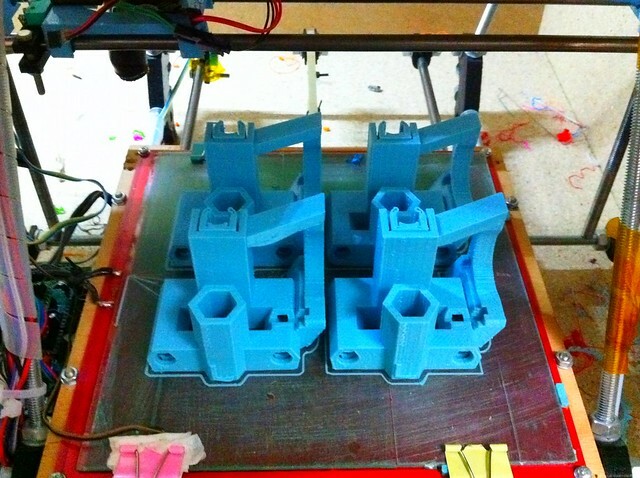 When I have RepRap presentation I always say that I update my printer almost every week. If you watch my GitHub Repository, you must be puzzled now. It's a long time since my last commit there. But when you look closer you would find out that the printer lived in Felt branch last few months. It evolved into something much slicker, smoother and sexier. While keeping it's workhorse spirit. It was already build on many workshops and it speeds up the build by many hours! Forget glueing the bushings, that was soo 2010. You have possibility to use Igus professional bushings, brass tube, felt, pla printed bushing or even printer lm8uu alternatives. 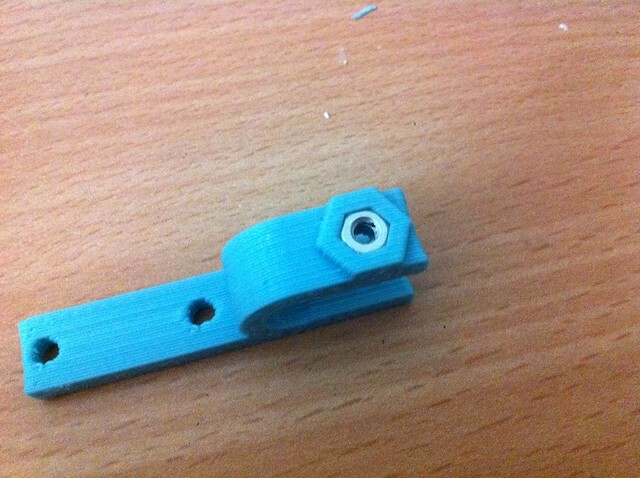 All bushings are simply snap in mounted, you can easily maintain your printer! Are you sad?? You shouldn't be, parts will work with both metric and imperial fasteners. Get M3 for small fasteners (you need them for NEMA 17s anyway) or #4 imperial ones if you really need to. 5/16 rods will work in place of M8 without any change! All M3 nuts have nut traps. I've done workshop where everyone had only one Philips screw driver and two wrenches fro M8 nuts! No jigs or measurement during print! Rods are exactly length you need from end to end. That's kinda hack. PCB heatbed actually works as second plate. 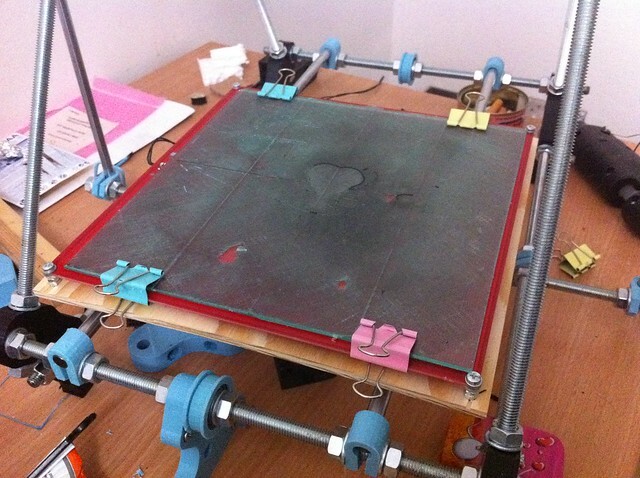 But it needs no leveling at all and frees lots of space under Y axis for electronics or PSU to make tidy, cute printer! I use T2.5 belts instead of T5 for a long time, and it affects the quality more significantly then any lm8uu would ever do. Now it's official suggestion, get GT2 ot T2.5 belts and machined pulleys! Be professional! I get best team to help me manufacture the new documentation! Kliment and Garry Hodgson (you many know him form Prusa Mendel Visual instructions). Expect to see it pretty soon! And fully done in ThingDOC! Watch out my GitHub, Flickr and Twitter to get latest updates! 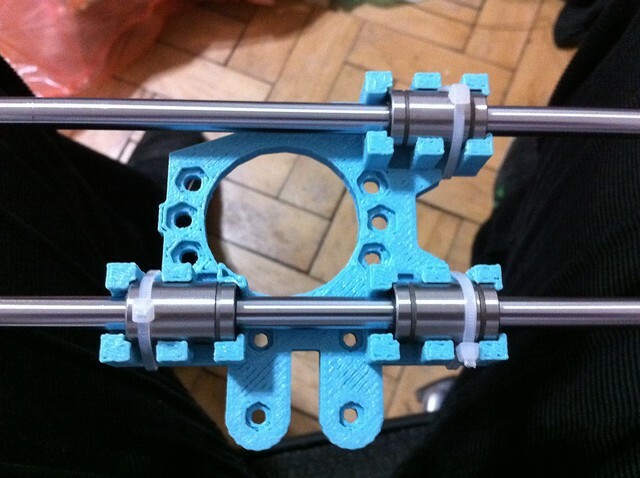 It IS possible to print T2.5 pulleys. I printed a bunch of beautiful MXL (2.032mm pitch) pulleys for a printer I'm working on. I printed them in ABS with a .4mm nozzle, .29mm layers, and a thread width of .435mm. The trick is to design them so that the teeth are rectangular with a width of exactly two (or some multiple of two, for larger pitches or extremely high resolutions) thread widths, so that the teeth are solid. I also found that due to the inherent rounding of the small corners, these pulleys mesh nicely with the nylon gears on some small DC motors I bought, and I'm working on a printable servo based on them. Very exciting, I can't wait to print it! Did a snap-in extruder make it in there? BTW, I have mostly ported the visual instructions to LaTeX. I hope you guys will consider using it as a base for the updated guide. I'm sure you will agree that LaTeX is a much better format for collaboration. Anybody have links for T2.5 belt and pulley sources? I'm having trouble finding one that doesn't require international shipping to the US. Maybe we can also find a pulley that is equivalent to the current one and wouldn't require any firmware tweaking. 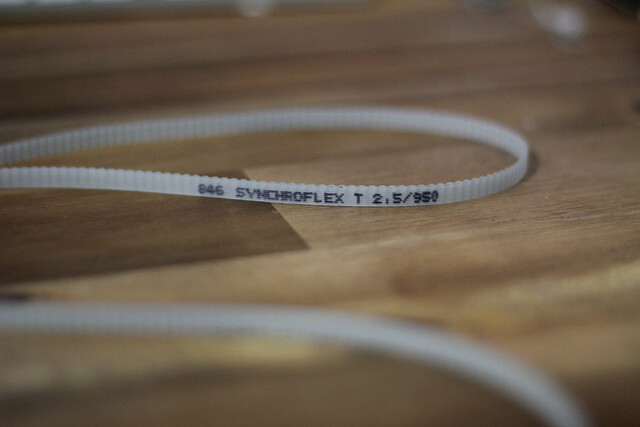 In the US, you can easily find MXL belts, which are a finer pitch than T2.5 (2.032mm vs 2.5mm) and matching pulleys. You'll have to recalculate the steps/mm, but it's probably easier than sourcing T2.5. This is no different from substituting SAE rods for their metric equivalents. Is there in fact anywhere in the world that stocks T2.5 16 tooth or T5 10 tooth with a 5mm bore? Yes blanks are no problem, and I have a lathe, taps and reamers, so I can bore them accurately but what do people without lathes do? Seems odd to have a new vitamin that cant be bought anywhere. Nophead, have you tried printing them? If my CupcakeCNC can do it, it should be easy for Hydraraptor. No I haven't tried printing T2.5, but everybody seems to be advocating metal pulleys for accuracy. The only ones I have seen for sale are T10 on eBay and they don't work because the teeth are too thin. I think it's more the point they are now a vitamin and not easy to get hold of, rather than it being impossible to produce. I've printed some decent pulleys before on a dimension machine but thats not available to most. Would GT2 belts/pulleys make a better substitute? Looking at this page: http://www.misumi-europe.com/lang/EN/inc/pdf/18_EFA_2011_Volume_1.pdf it seems that 2GT are better for positioning accuracy than all the others, so it looks like we should use them for that reason. only problem is misumi also don't do a 2GT 16 tooth with 5mm bore! Would it be easy to recalculate the steps/mm to allow for a 18 tooth 2GT or MXL pulley? Recalculating for the different belt pitch is as simple as multiplying the steps/mm variable by the ratio of the two belt pitches. If your pulleys have a different number of teeth, you'll need to do the same with that ratio. This is easy math. Pulley Vitamin aside, its so great to see Mendel looking this streamline... mechanical simplicity is everything in this game, good on ya! I agree 100% with your suggestion for smaller belts. I bought GT2 belts and pulleys and haven't looked back. 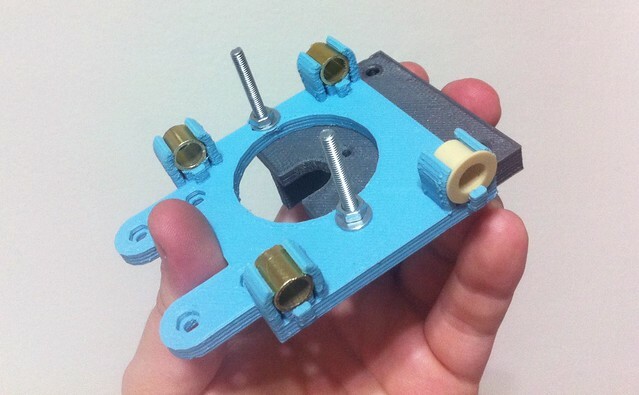 Is there an ideal way for arranging the parts on one plate for printing on a prusa mendel? (It made it seem like it was possible in the instructions.) If not, is there a better way to split it up? How about these http://www.technobotsonline.com/synchroflex-timing-pulley-t2.5x6mm-16t.html for T2.5 timing pulleys? Hey, I've used GT2 pulleys and belts on my Orca :S - i know... but sdp-si do sell 22-tooth gt2 pulleys 5mm bore. Not found a UK supplier, which isn't surprising really. And that's not majorly different in steps/mm from the original nophead pulleys. (slightly lower steps/mm). Only thing left to do is sort out z-axis with the same. They say they will do customisation but when I asked for a quote they never replied. I have to say using the iteration 2 parts with a iteration 1 hardware kit isnot a good idea. I wish there was some solid documentation for this set of parts. Please note: This is NOT my work.